Born Kathleen Morrison Aug. 19, 1900, in Port Huron, MI. It was her Uncle Walter Howey, editor of the Chicago Tribune, who arranged for Moore to be introduced to D.W. Griffith. She started off with small parts in several Triangle films, none of which were directed by Griffith. Her first starring role was as Annie in "Little Orphant Annie" in 1918. Her next film was in Charles Ray's "The Busher" (1919) as the love interest which also had a then-unknown John Gilbert as the bad guy. She also starred in a couple of westerns opposite Tom Mix in 1919 and 1920 and admitted to falling in love with her leading man. She stayed busy making features and even working in a few Christie comedies. Then in 1921 she made "The Sky Pilot" which was directed by King Vidor, a man whom she reportedly loved all her life despite marrying others. They remained close friends until Vidor's death in 1982. In 1923, she married First National press agent John McCormick, and, although their marriage was a stormy one (mainly due to McCormick's alcoholism), he took over her career and guided her through her biggest films of the twenties. The role that made her a star was "Flaming Youth" (1923). This started the flapper craze of the twenties and Moore's Dutch-bob hairstyle in the film also set off a new craze, as well. After the success of "Flaming Youth," First National signed Moore to a contract at $4,000 a week. Moore made over 20 more films during the 1920's. She was most recognized for her light comedies such as "Irene" (1926), "Ella Cinders" (1926), "Twinkletoes" (1926), "Orchids and Ermines" (1927), and "Naughty But Nice" (1927). One of her best dramatic performances was in Edna Ferber's popular tale "So Big" (1924). One of her last silents was one of the best World War I pictures of the silent era, "Lilac Time" (1928) which co-starred the then up-and-coming Gary Cooper. 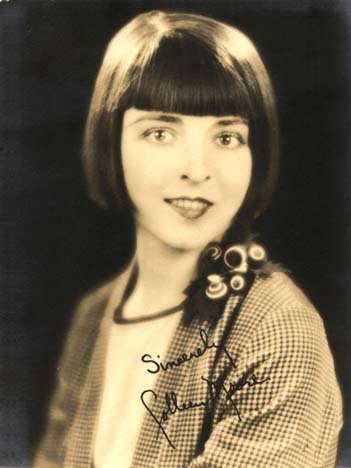 She made two more silents before her first talkie, "Smiling Irish Eyes" (1929) which proved to be unsuccessful. She made four more talkies before retiring with "The Scarlet Letter" in 1934. Moore had divorced McCormick in the late 1920's and married New York businessman Albert Scott in 1931, although the marriage was short-lived. Moore appeared in a few plays during the thirties, but retired from acting altogether in 1937 when she married stockbrocker Homer Hargrave. The two were happily married until his death in 1967. Moore was a wealthy woman who traveled and wrote books about the stock market and her famous doll house which she began in 1928 (it is now housed at Museum of Science and Industry in Chicago). Moore died at her home in Templeton, CA. Jan. 25, 1988.